Successfully Added Haier Coffee Maker - Bean Grinder, 4 Cup Capacity, Keep Warm Function, Easy to clean, Elegant Design to your Shopping Cart. This exquisite coffee maker will brew the perfect cup coffee every time. With its built in grinder it can turn 40 grams of beans into a fine coffee granules in about 30 seconds and lets you go from beans to coffee in no time, so you can enjoy a fresh brew whenever you wish all at the touch of a button. 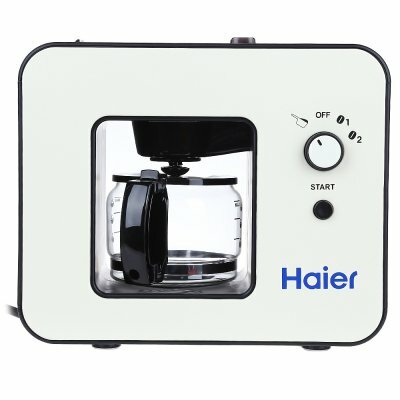 Made by leading Chinese electronic manufacture, Haier, with over 4 decades of experience making home electronics, this elegant coffee maker is the perfect addition to your kitchen letting you enjoy that morning coffee ritual in style. The separate grinder and filter makes for an easy cleanup and allows you use coffee beans or ground coffee of your choice. With a built in thermostat the coffee maker ensures the perfect temperature of your water and avoids burning the beans so you can be sure of a perfect flavor every time with this bean to cup coffee machine. A warming plate will keep the made coffee nice and warm for up to 30 minutes and the 4 Cup brew limit (about 580ml) ensures there is enough of your favorite caffeinate pick me up for even the toughest of mornings. From beans to freshly brewed coffee in a matter of a few minutes this stylish compact coffee maker comes with glass carafe, coffee spoon and brush to make use and cleaning quick and easy. Enjoy the perfect start to your day with the best drip coffee maker from Haier that comes with a 12 months warranty, brought to you by the leader in electronic devices as well as wholesale kitchen appliances and home gadgets..